The very simplest way to save is just to stash some cash. Think moneybox. No faff, no paperwork but admittedly no interest either. Luckily, our house is not lacking in moneyboxes, as you can tell from the selection on my son’s mantelpiece. One of the perils of being the child of a money blogger is that money boxes shower down from all directions. Pigs, dogs, ducks, pirates, fairies, knights, princesses and even a mini safe complete with combination lock all compete for our coins. Sadly most are completely empty. Back on our wedding day, my husband and I were the grateful recipients of a terramundi, one of those ceramic money pots you have to smash if you ever want the cash. We decided to use it for any £2 coins we came across, diverting them to the money pot rather than spending them. Spotting £2 coins and hanging on to them is a pretty painless way to save. The only drawback was that I started resenting getting multiple £2 coins in change, knowing they’d have to go into the terramundi, and I’d have to go the cash point sooner. Fast forward a year later though, and the genuine benefit was revealed. When we cracked open the money pot, nearly £600 in £2 coins spilled out. That really slashed the cost of Christmas. 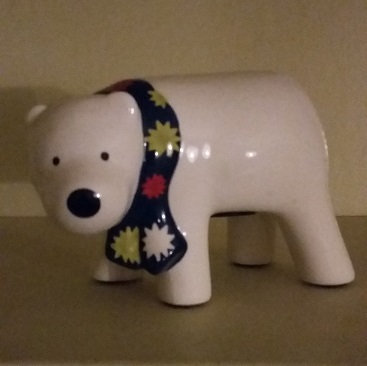 Meet polar bear money box. We really pushed the boat out with that name. This polar bear money box is the successor to the smashed money pot, but recently we haven’t been as disciplined about £2 coins. I started raiding the polar bear, to top up cash payments here and there. I fear the Suffolk tooth fairy has also been known to snaffle the contents to swap for teeth. 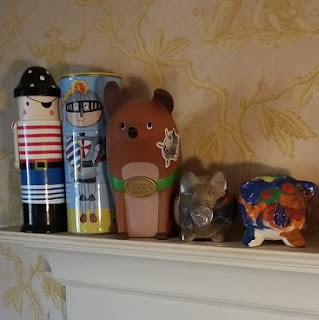 So as the first day of our October saving challenge, I declared the polar bear money box back in business, and my husband has reenlisted in £2 coin collecting. The current balance is an embarrassingly low £8. Now that I tend to channel most spending through a credit card, so it earns cashback, I fear I may not get many £2 coins in change. Still, every little helps towards the October savings challenge (read more about the challenge, and the article that sparked it, here). Let’s see what the new balance is by the end of the month. Anyone else use a moneybox to stash some cash? Anyone up for a spend less, earn more, save loads challenge during October? I’d love to hear! Previous Post Do you have more than £100 in savings? Yes, we use assorted moneyboxes. Dan pays himself £2 any time he cycles to work. Any time I make a saving on something I'd have bought anyway I save the difference, just little things like that. Many cheers for a fellow moneybox fan, and I applaud Dan's cycling. Really interesting that you set aside the difference compared to what you would have spent. Normally I'm just glad there's less going out of our bank account! However, I have started tracking in my spending diary the value of vouchers & loyalty points used to cut our costs, even if I don't transfer that value into a savings account. It's running at more than £560 for the first nine months of the year, so it definitely does all add up. Yes, I have money boxes too. We use one for £2 coins like you, it is a proper plastic Rovers Return saving bottle. We also save bits and pieces of change in a clear plastic savings tube, a wooden barrel and a plastic tub. I also have other saving boxes which don't get used, like a telephone box and post box and I also have a miniature milk churn from Cadbury's, which isn't very big. I used to have more than that, but had a declutter.